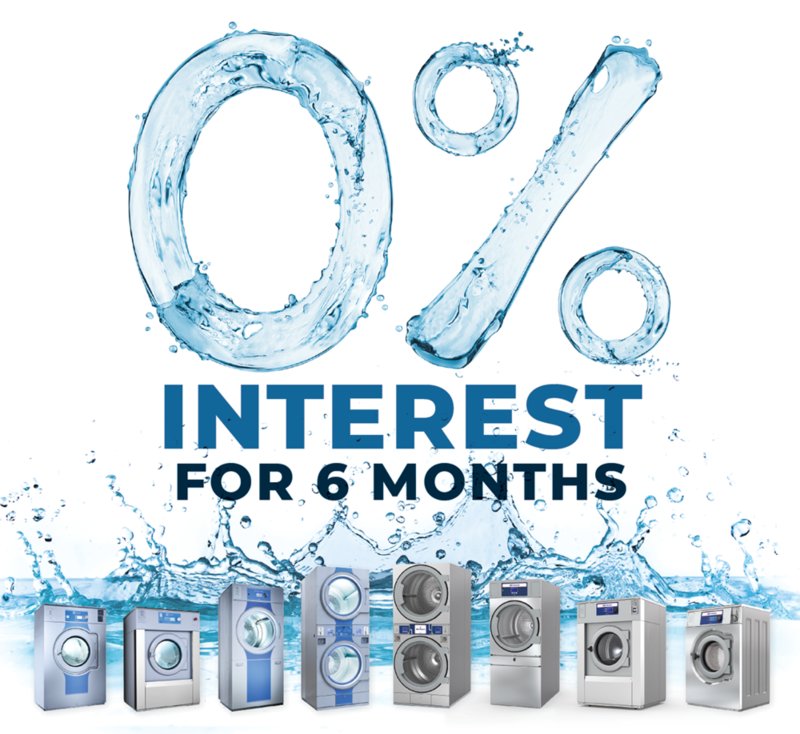 Contact us for great financing on Electrolux products. It as simple as a one page finance application. Limited time only. Under Section 179 businesses may deduct the full purchase price of equipment in the year it is purchased — up to $1,000,000. This is different than the traditional method of writing off equipment in stages through the depreciation cycle. The equipment needs to be put into use by December 31st, 2018. Consult your CPA or tax professional. 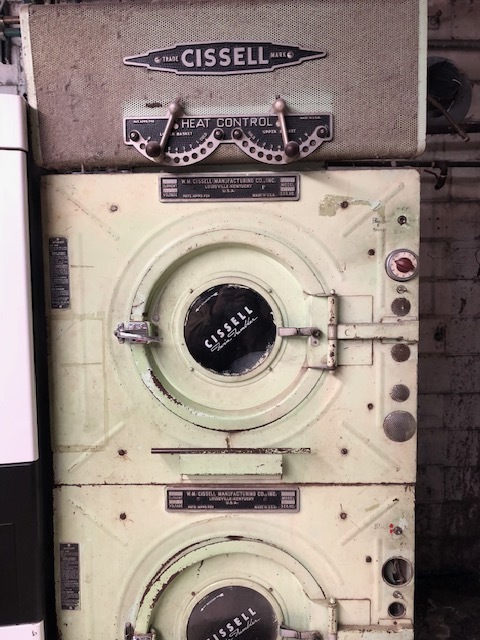 We pulled this old dryer out of a dry cleaners. The customer said his dad bought it used when the customer was 15…he turns 65 next week. That makes it over fifty years old. The weight was phenomenal. Details to note: On the hinge is a handy clip to hold a piece of paper. The four circles on the right below the timer are button covers; each of them are chromed, domed, and perforated. 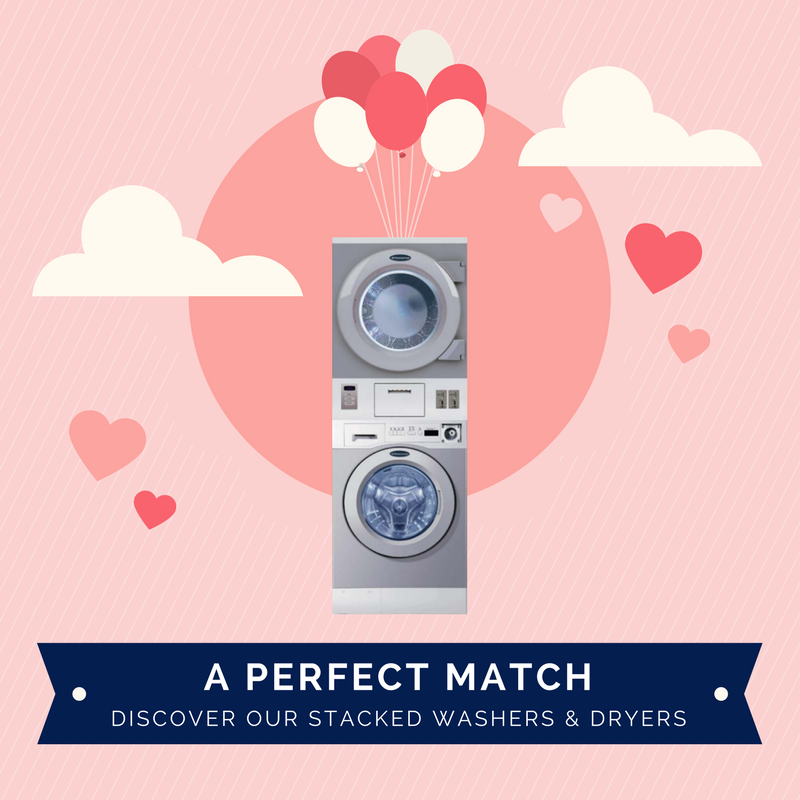 Ask us about our great washers and dryers for the healthcare industry. We can improve your hygiene standards with a barrier washer. Look on the spec sheet and note the width of the machine. Will the machine fit through all of the doors leading into the laundry room? Electrical specification. On the quote an electrical specification for the machine will be given. For example it may be "208-240volt/1 phase". Does the electricity supplied in the room match this? If you have an existing machine you can check that machine's serial number plate to see what electrical specification it is using. If you have no idea a volt meter may have to be used. The machine spec sheet will also tell you the correct size breaker to have. Note: If you are ordering a single phase machine and have three phase electricity the install will still work; our technician can "drop a leg". For washers, is your drain in good working order? Is it large enough and properly vented? For dryers, do you have fresh, make-up air behind the dryer? Do you have a large enough vent duct? Most dryers we sell use an 8” duct not the common household 6” duct. You can check the machine spec sheet for the right size. Finally, if you are buying a gas dryer are you equipped with the proper shut-offs and a flex hose that will work for the dryer? 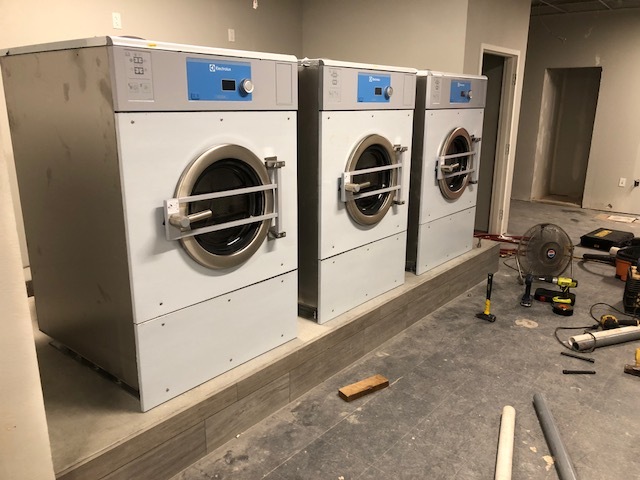 Laura is a sharp laundromat operator in Mustang, OK. She chose to replace one old washer that she was using as a greaser and also add in three new machines. Here is a Wascomat drain after a pillow exploded in the tub. Fix was to just pull the nylon pillow filler out of the drain and fish more of the pillow filler from under the tub. American Dryer 460 volt, all-electric, 3 phase dryer. 50 lbs. In top shape. OPL microprocessor. $1,250. Call Ken at 405.424.4318 and mention you saw it on the website. Laundromat equipment will cost anywhere from $75K-550K based on size and you should hope to make $50K-250K in revenue. That is not a promise of future returns. 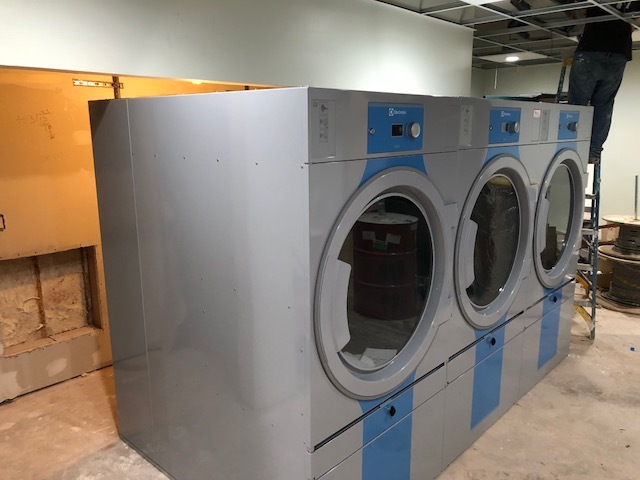 To build a laundromat you are going to need a lot of information and help. Please call us and let us have a kickoff meeting. At Arrow Machinery, we are a low-pressure distributor; however, we’d like to be involved from the start to help you make the right decisions. If you are a property owner this step is about gauging how your location can perform. If you are a business in search of a location this is more about what to look for. A real estate broker would be involved at this point. Complimentary retail is good. Check cashing, auto parts store, pawn shops, and dollar stores are good. You will be locked in to what you pay for rent but what equipment you choose does affect your cost structure. Water, gas, electricity, and repairs depends on your equipment choice. Second, you don’t want to be over-equipped or under-equipped for your market. Total washing capacity matters. Next, the blend of equipment, from small load capacity machines to high capacity machines matters more than you think to the bottom line. Larger machines mean more loads per square foot. Larger machines also draw in customers who need to do loads larger than their home washer such as blankets and sleeping bags. Often the margin on large machines can be greater. Are you going to go with a coin or card system? They each have their strengths and weaknesses. Customers historically think of laundromats as coin-operated. Card systems make collecting and counting money from your laundromat easier. Card systems also offer the benefit of float. It is about choosing what is right for that individual laundromat. 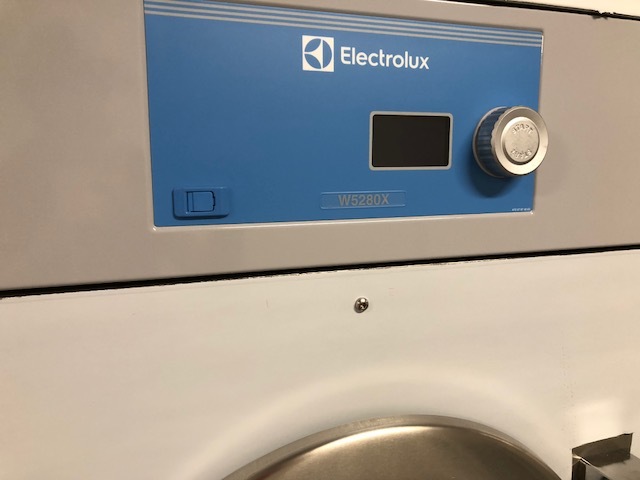 Finally, choosing the right accessories for a laundromat improve its efficiency. Chairs and folding tables are a great part of the customer experience. Pre-fabricated racks help keep a clean look and can help future service technicians with access to the machines. Bill changers and carts matter on moving customers efficiently through the laundromat. Now it is the fun part, creating a layout. If you have done your homework on marketing and equipment mix this goes easier. With Arrow Machinery we will provide layout drawings so you can see traffic flow and function. 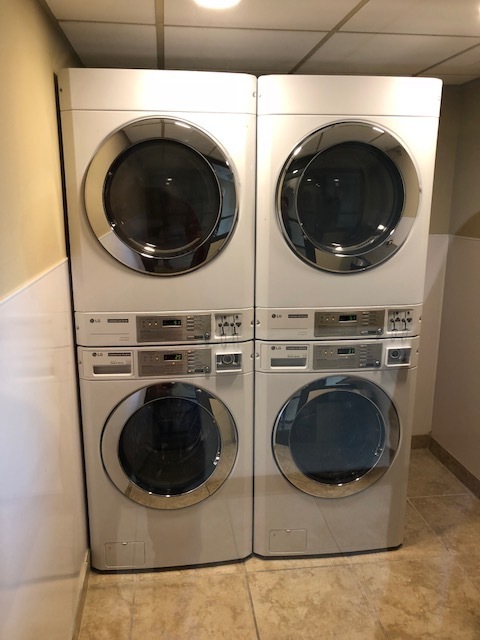 Some of the classic questions are: Do you have enough room behind the dryers to work on them? Are the washers broken up into “islands” so traffic can flow around them? Are there enough folding tables? Do you have enough space in the racks behind the washers? Have you eliminated as many columns or service drops as possible so that visibility is enhanced? When your layout is complete you will have an equipment schedule and the specifications needed to compile plumbing, electrical, and venting. This is not a proforma but does lead to you coming up with the information to make financial projections with your accountant, lawyer, or financial professional. Starting with your equipment list we come to a pricing mix. With pricing and turns-per-day you’ll know your projected revenue. There are alternate income opportunities to consider such as bundle wash and vending. Based on the equipment we can project utility costs. With the location work already done we can also plug in rent. Labor depends mostly on the hours your plan to stay in operation. Other costs include insurance, security, and maintenance. Finally, we can look at financing. 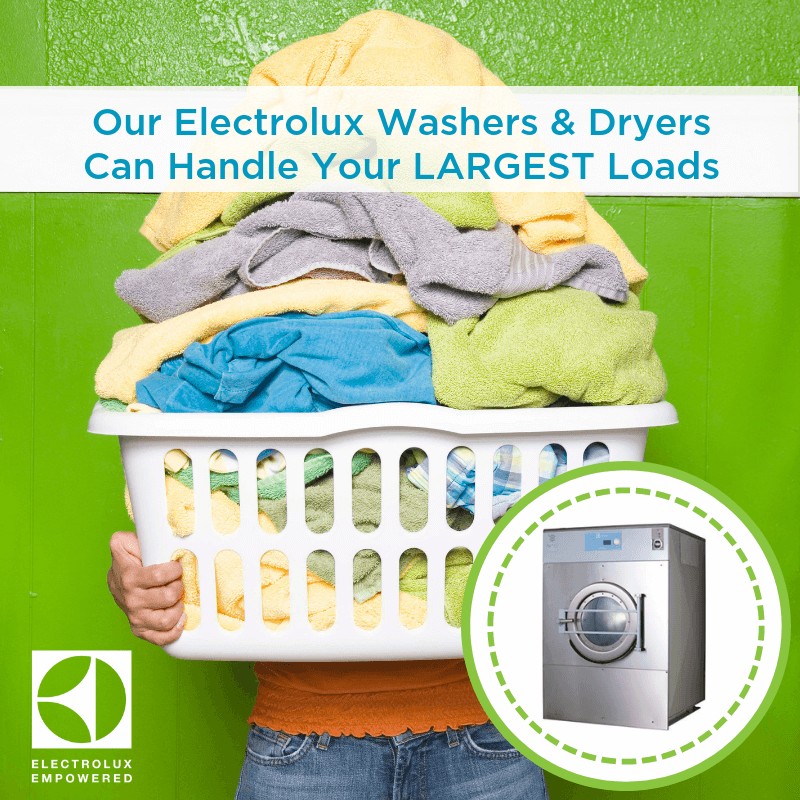 Laundrylux provides great financing for Electrolux and Wascomat products. Now we are ready to place your equipment order. Arrow can coordinate equipment delivery around your construction delays. We have experienced technicians that can help install your equipment quickly and correctly. Tools and know-how make a big difference. 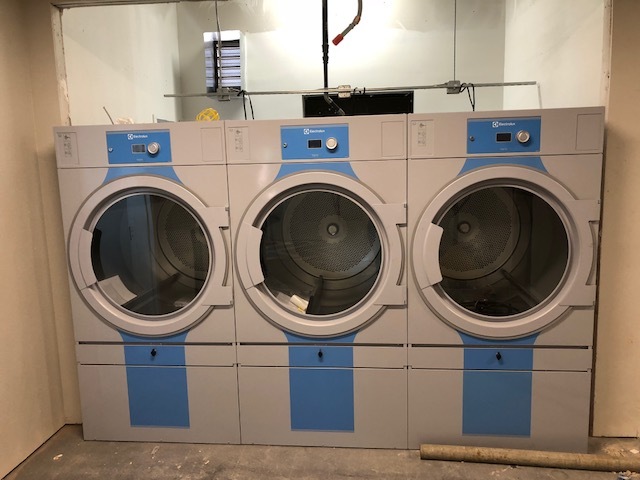 Based on the pieces of equipment and your layout we can fairly well estimate how long it will take to install your laundromat.